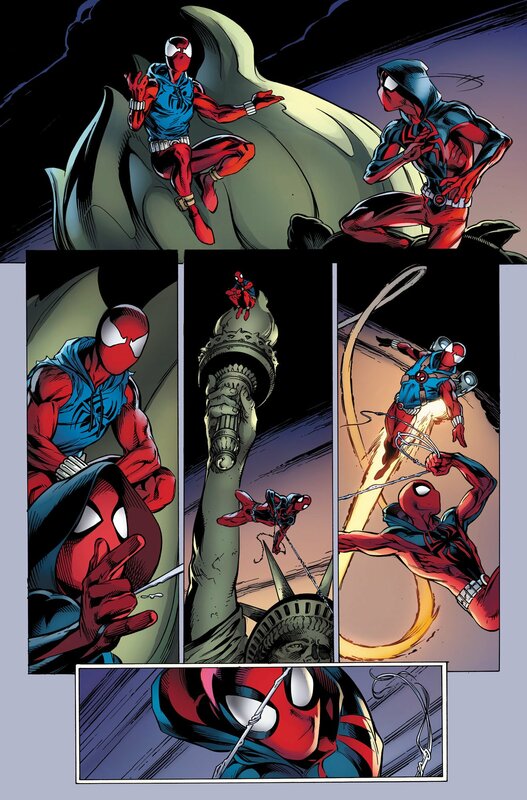 Ben Reilly returns to being the Scarlet Spider in a fun opening issue that will delight fans of 90s Spider-Man comics. If you’ve been following the recent The Clone Conspiracy arc, you’ll know that a forgotten figure from Spider-Man lore has made a shocking return to the comic book world. 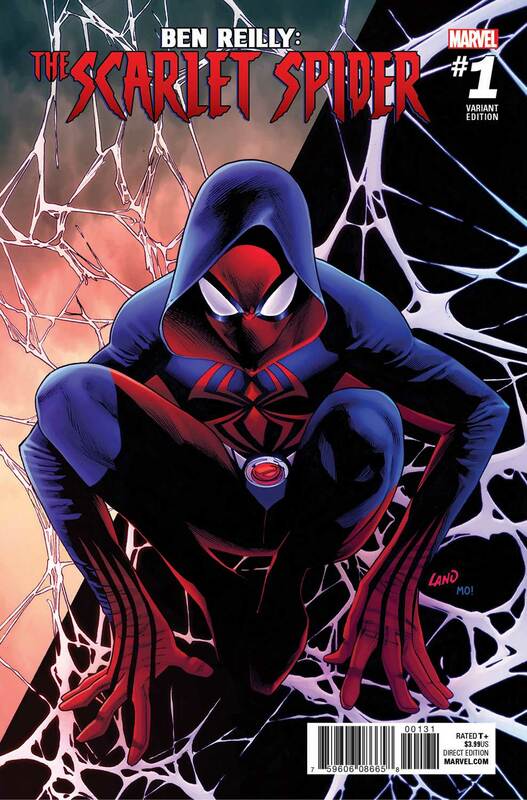 Namely, Ben Reilly, the clone of Peter Parker who goes by the name of Scarlet Spider. 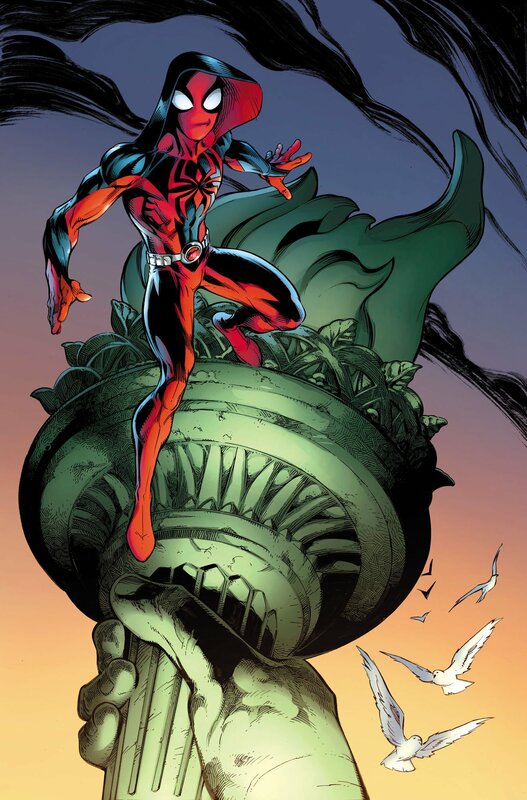 Now, he’s getting his own series once again, and it comes courtesy of Spider-Man comics legends Peter David and Mark Bagley. Thankfully, things get off to a swinging start (hey, it’s an oldie but a goodie) with issue #1. 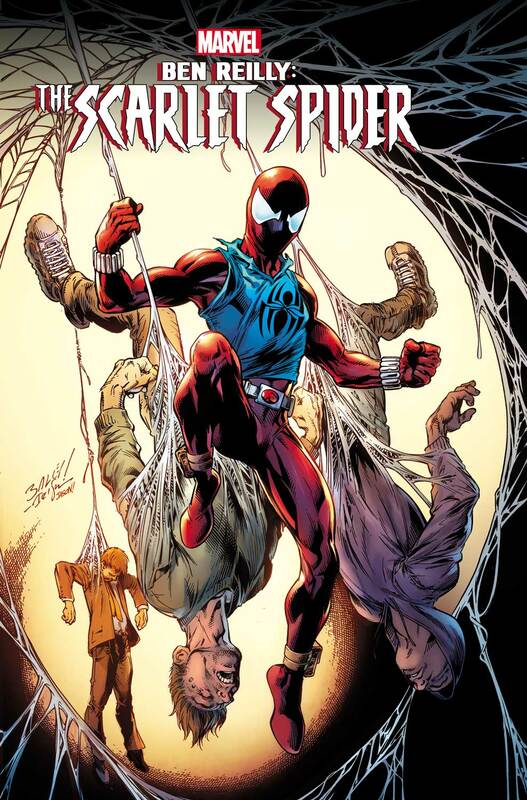 In Ben Reilly: The Scarlet Spider #1, Ben has moved to Las Vegas to avoid the attention of Peter Parker. In order to get his life – and his fractured mind – back on track, he’s looking to find himself his own version of Peter’s life. A Mary Jane, an Aunt May, a career as a superhero, etc. But Ben is going to find out that he can’t sweep his past actions under the rug that easily…. 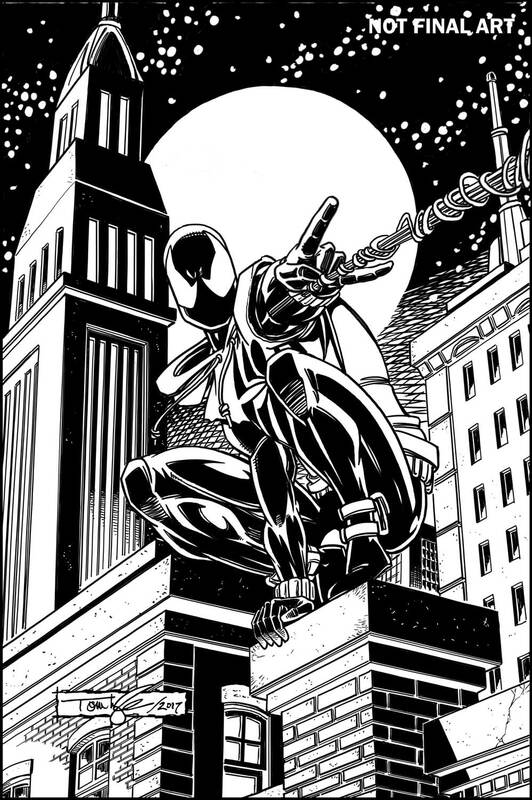 First of all, the main area in which this issue succeeds is in the examination of Ben Reilly’s character. Though he doesn’t like to think of himself this way, he did recently take a turn down the dark side (“you had a scheme that failed thanks to Spider-Man. Kind of makes you the bad guy by definition”) and now he has to work out if he’s going to be a hero or a villain. Writer Peter David expertly gets across just how different Ben is from Peter right off the bat in the first few pages. For instance, the early action sequence where he foils a mugging in a very un-Spider-Man-like way. Ben is also seriously messed up in the head. With a strong blackly comic streak, much of the humour from this issue comes from his arguments with the different sides of his personality. Like in old cartoons, he has his angelic side and his demonic side sitting on his shoulder, telling him what to do. 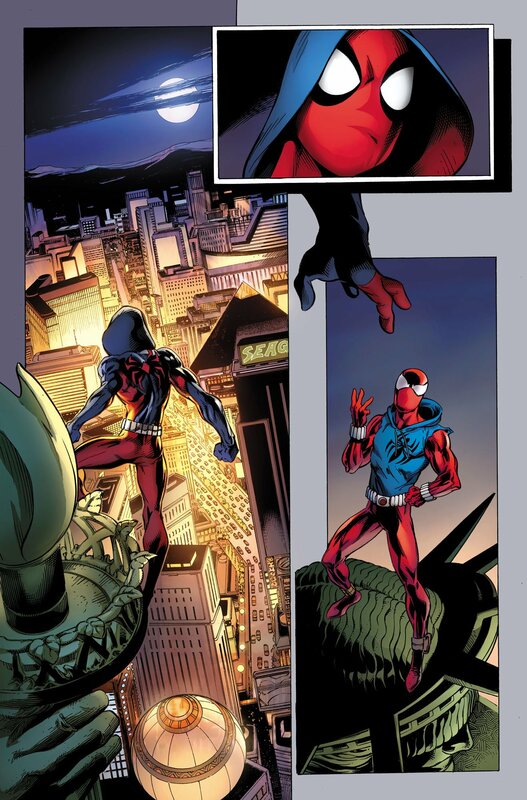 The classic Scarlet Spider represents his hero side while the Jackal symbolizes the pull of supervillainy. All this makes Ben a vibrant, engaging lead. The only thing is that his constant joking in the face of his amoral ways sometimes hues a little close to Deadpool. We’re not saying there isn’t room for too wisecracking, bone-breaking anti-heroes dressed in red in the Marvel universe, but it would be unwise for Scarlet Spider to try and beat the Merc with a Mouth at his own game. As he’s been drawing Spider-Man titles for nigh on thirty years now, Mark Bagley’s artwork is naturally extremely solid with nary a panel out of place. 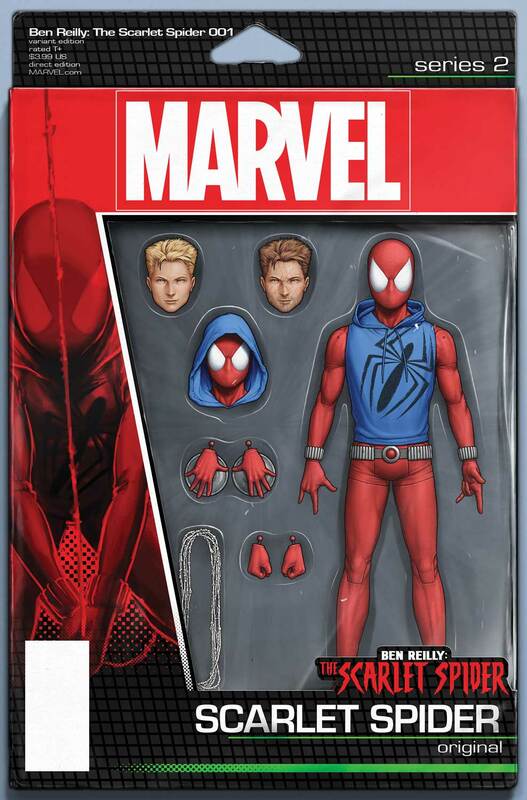 The big visual talking point of this issue is Ben Reilly’s new outfit. It’s a good update as it streamlines the baggy, homemade of his original 90s era costume, but right now, we still prefer the old one. The in-universe explanation for it will raise a chuckle, too – apparently, he stole it off an inventive cosplayer. Ben Reilly: The Scarlet Spider #1 is a delight for fans of 90s era Spider-Man comics, as it sees two creators of the period reunite to relaunch one of the decade’s most important Spider-people. It doesn’t just leech of nostalgia, though, as it also sets up a promising new character arc for Ben which should be interesting to see unfurl.